Storm clouds are gathering overhead again this week, threatening to bring more rain. Mudslides and flooding closed area roads the last two weeks. I am just glad I do not have to be out in it. The weather has been perfect for curling up on the couch with a mug of hot chocolate and diving into Rachel Caine's Weather Warden Series. I can just imagine Joanne Baldwin, one of the most powerful Weather Wardens working her magic along with other Wardens with varying gifts to divert or calm violent weather, tame raging wildfires, or heal and manipulate the earth. While the storm above my head isn't likely to warrant intervention, other more deadly storms would. The novels follow the character of Joanne Baldwin, a rather rebellious and independent woman who can control the weather. She loves high fashion and fast cars, but she also values human life and will do anything to protect mankind. She is part of a secret world organization that has used their power to protect humans and their property, controlling and manipulating the weather, mastering fire, and healing the earth and injured, for thousands of years. Each book in the series is pretty much nonstop action from beginning to end; the tension remains high throughout. This is a series that is best read in order, one book's ending leading straight into the next. As a result, it would be impossible to discuss each book in the series without risk of spoiling anything. I am going to try though. In the first book of Rachel Caine's series, Ill Wind (Roc, 2003; 337 pgs), Joanne is on the run for her life, accused of murdering a fellow Warden. She has other problems too, which only complicate matters. In order to clear her name and save her own life, Joanne seeks the help of an old friend, Lewis, the most powerful Warden known--and also the most wanted. Lewis has been hiding for years, on the run himself for stealing three Djinn, magical beings that have been used by Wardens for thousands of years to do their bidding. In Heat Stroke (Roc, 2004; 335 pgs), Caine takes the reader into the world of the Djinn, both those bound to Wardens and those who are free. Joanne's life is again in danger as is the life of her lover, David, a powerful Djinn whom we meet in the first book. There is a very real threat out there to all humanity and the Djinn, and Joanne and David may be the only ones who can stop it. Despite the title, things heat up in Chill Factor (Roc, 2005; 337 pgs) when Joanne goes after a teenage boy who can not only master fire, but came into other extraordinary powers by stealing them from a Warden. He is extremely dangerous. While trying to take him down, Joanne is haunted by her past, a past that takes form in the present, yet again putting her life at risk. Joanne's sister moves in and Joanne is on the outs with the Wardens. Joanne wants nothing more than to make a new life for herself. Yet someone is out to frame her. In Windfall (Roc, 2005; 320 pgs), Joanne realizes she cannot shake them no matter how hard she tries. With the Djinn on the verge of civil war, Joanne has her hands full once again. This is perhaps the loosest put together book in the series, and the on with the most humor. In Firestorm (Roc 2006; 292 pgs), the Djinn are bucking the chains that bind them, wanting their freedom from the Wardens who have enslaved them for centuries. There are those who want all Wardens to pay--with their lives. As the natural balance of life begins to go off kilter, Mother Earth is beginning to wake from her long sleep. This poses an even bigger threat given she isn't very happy. Thin Air (Roc, 2007; 307 pgs) is my favorite of the series. It also serves as a transition point from previous books in the series into the next few. Joanne has lost her memories and must find them again or risk losing herself completely. She has her work cut out for her. An impostor has stolen those memories and stepped into her life. 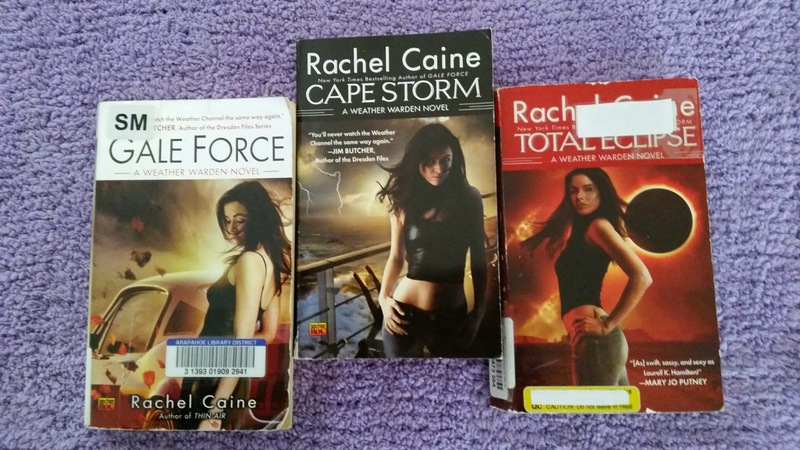 Gale Force (Roc, 2008; 306 pgs), Cape Storm (Roc, 2009; 306 pgs), and Total Eclipse (Roc, 2010; 303 pgs) finish off the Weather Warden Series as David asks Joanne to marry him. There are those who will do anything to stop a powerful Djinn and Warden from making vows to one another for it is unknown what exactly that will mean for the humans and the Djinn. It could make one group vulnerable to the other--or weaker as a whole. Or perhaps it will do just the opposite. At the top of the list of those wanting to stop any wedding is an old enemy of Joanne's, a man who has a weapon that can wipe the Djinn out of existence. If that isn't bad enough, Mother Earth is now awake, and she will stop at nothing until all of humanity is destroyed. In each book, Joanne faces life and death situations, and frankly I am in awe of her resilience and strength. While she does get herself rescued a lot, often by one of the men in her life, she proves many times over she can think quickly on her feet and isn't afraid to think outside the box. She weighs all the consequences before jumping into action, even when it means putting her own life on the line. Joanne and David's relationship plays a significant role throughout the series, often in life altering ways. Love between a Djinn and a Warden are forbidden for a reason. I admit I didn't quite buy into the love story between Joanne and David at first, but it grew on me after awhile. I mean, David is pretty awesome. And he is very devoted to Joanne, sometimes to a fault. Power is a heavy burden that can easily corrupt. Joanne finds that out all too quickly. The Wardens are not as clean as she had once believed. Joanne is not sure who she can trust, even among her family and friends. The Weather Warden series has is it all: plenty of white knuckled action, a high (I mean really high) body count, corruption of power, backstabbing, revenge, retribution, steamy romance, with a hint of humor. In the final three books, the "protect the environment" message was hard to ignore (at least for me), but there was also an underlying message of hope and faith in humanity. 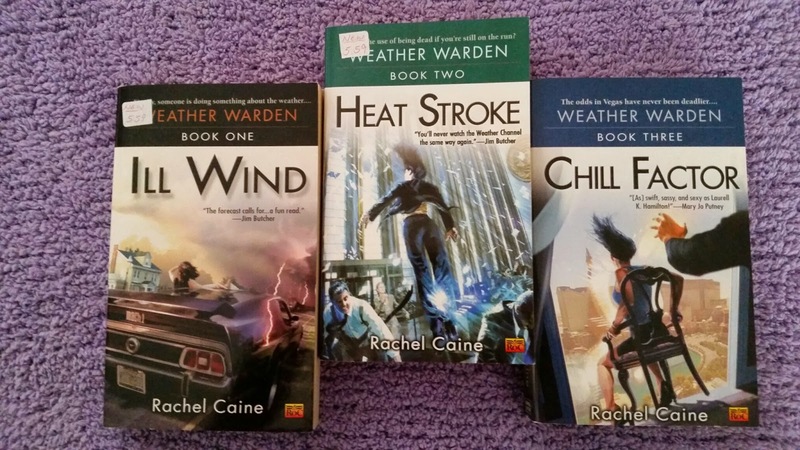 Rachel Caine is a gifted world builder, and the world she has created in the Weather Warden Series is full of interesting characters and history. I was so taken with her books that I raced through the entire series. At one point, I missed an entire toddler tantrum and fuss that happened right in front of me--I was so engrossed in one of the books. I understand Caine has another series set in the same world, following different characters. I may just have to check it out. 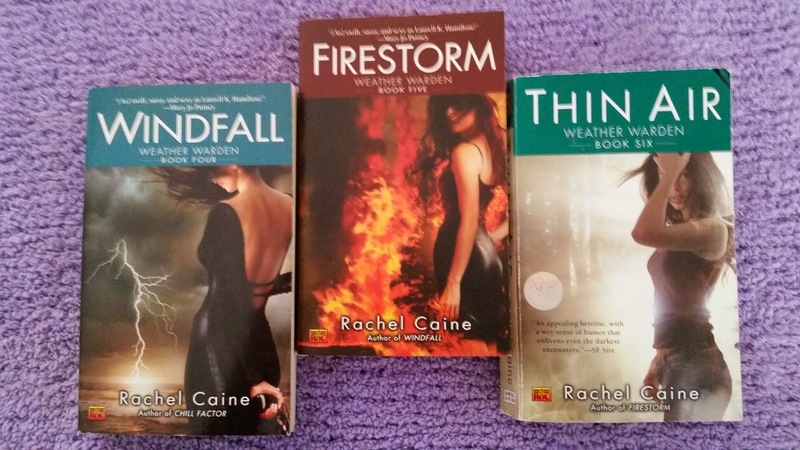 You can learn more about Rachel Caine and her books on the author's website. Source: I purchased all nine books for my own reading pleasure. I remember this series when they're first released but didn't pick them up. Joanne sounds like an interesting character. I'm hoping to read them in the near future. This is an interesting premise, and I can't resist an author who is a skillful world builder! :-) Thanks for introducing me to this series. Irene - It really is an interesting premise. I didn't like the series quite as much as I enjoy Butcher's The Dresden Files, but these were fun reads. I haven't come across this series but it sounds interesting. I like that the world is well developed! Katherine - I wish I could remember who recommended the series to me. It was so long ago. This post was so favourable for this series that I had to run to check and make sure I still had the first book in the series, which I haven't read yet. I have it, so it's on my TBR asap pile! lol Good review, Wendy. I enjoyed how you took us through the series as well. Glad you enjoyed it so much too! Susan - I hope you enjoy the series if you give it a try. My only regret is that I don't have a longer leave to spend more time reading. Isn't that terrible? I go back to work the week after next and I just know my reading will suffer. This sounds like an interesting series--perfect for a rainy day. I love rain, but not the type you've been experiencing. Stay safe! A.M.B. - Yes, the stormy weather seemed perfect for these books. :-) Luckily I was home bound through the worst of it, safely snuggled on my couch. Thank you. I'm not familiar with this series, but I will keep it in mind. If I really enjoy a novel, I'm always glad to know there are more in the series available. Jenclair - It's an older series, and one you might like if you come across it. Although I didn't read all the books straight through (I read three back to back at a time, interspersed with Christmas themed romances), but by the ninth book, I was glad to be done with the series. It's been a long time since I binge read like that--books in the same series.